A few days ago we reported that the X10 Platform Ponzi scheme had collapsed. Accompanying the collapse was a series of emails sent out, asking for a fee in lieu of a final payment. What made the emails strange was that X10 Platform affiliates who’d never invested were also receiving them. Now a second email has been sent out, upping the fee requested and promised payout. 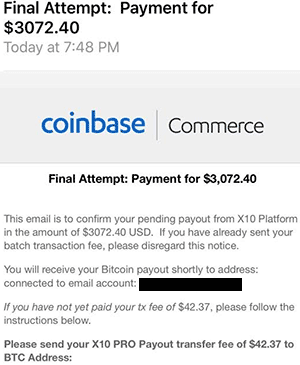 The X10 Platform scam email is CoinBase branded and promises a “final attempt payment” of $3072.40. The fee requested is $42.37, up from the initial ~$8.70 fee for a ~$372 payment. Perusal of the bitcoin address used to receive funds reveals almost 22 BTC (~$81,588) has been deposited by X10 Platform affiliates since February 27th. Payments spiked over February 28th and March 1st but have since subsided, likely prompting the new email. As of yet there are no recorded ~0.11 BTC deposits, suggesting X10 Platform affiliates might have wised up. As for who is sending the X10 Platform scam emails? That we don’t know. 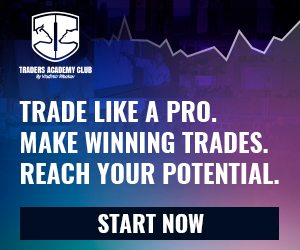 It is believed the X10 Platform’s admins sold the affiliate database to a third-party, who are sending out the scam emails. Owing to the anonymous nature of cryptocurrency however (at least on the front end) however, unfortunately we can’t say for sure. What we can confirm though is you won’t recover your X10 Platform Ponzi losses by sending bitcoin to random addresses.